Forests are increasingly valued for non-timber ecosystem services in place of conventional wood fiber production. Biomass carbon sequestration is one of the key ecosystem services forests are relied upon for mitigating global climate change. However, planning for large-scale tree planting and managing established forest stands for carbon sequestration require careful consideration of the gain in biomass production and tradeoff for other regulatory services. 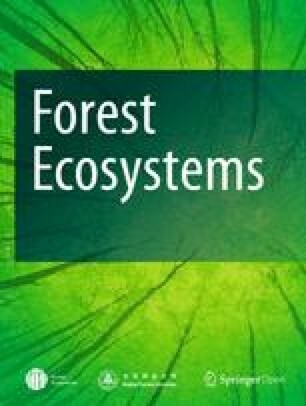 How a tradeoff between forest production and conservation of water resources is shaped by the condition of forest stand and environmental factors remains a question of broad interest in sustainable forest ecosystem management. We studied the spatiotemporal patterns of net primary productivity (NPP), evapotranspiration (ET), and water use efficiency (WUE), and their relationships with local climatic and forest stand factors over a temperate forest landscape in Changbai Mountain, Northeast China. The time series of spatial data on NPP and ET were extracted from the global remote sensing datasets for the MOD16A3 and MOD17A3 products for the period 2000–2014. The time series of spatial patterns of annual precipitation and annual mean temperature were obtained as grid maps for regional meteorological variables. Stand patches were categorized into the types of conifers, broadleaves, and mixed-wood, as well as age-classes of young, mid-age, near mature, mature, and old-growth stands, and by establishment into natural and planted. Information on stands and selective site variables were compiled from the Forest Inventory Datasets of China. Analyses were performed with Arc-GIS. Over the study period of 2000–2014, the landscape-level annual NPP varied between 311.7 and 573.6 gC∙m− 2∙a− 1, ET between 559.9 and 603.0 mm∙a− 1, and WUE between 0.54 and 1.01 gC∙m− 2∙mm− 1. Across the forest landscape, the mean annual NPP varied between 205.0 and 639.4 gC∙m− 2∙a− 1, ET between 441.5 and 784.0 mm∙a− 1, and WUE in the range of 0.46–1.10 gC∙m− 2∙mm− 1. 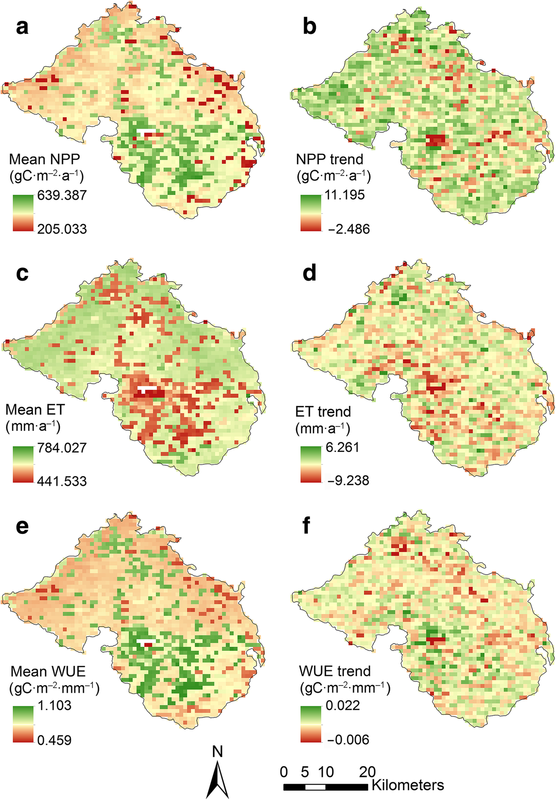 The spatial variations in NPP, ET, and WUE were commonly attributable to forest type, stand age class and density, establishment mode, and temperature variables, with some effects of other selective factors on ET and WUE. The three forest types were significantly (p < 0.05) differentiated in the mean annual NPP, ET, and WUE: the coniferous forests were highest in NPP (505.3 ± 1.4 gC∙m− 2∙a− 1; n = 1041) and WUE (0.872 ± 0.004 gC∙m− 2∙mm− 1; n = 1041), and lowest in ET (584.1 ± 1.6 mm∙a− 1; n = 1041), followed by the mixed-wood forests (NPP: 500.5 ± 0.8 gC∙m− 2∙a− 1; WUE: 0.856 ± 0.02 gC∙m− 2∙mm− 1; ET: 589.3 ± 0.9 mm∙a− 1; n = 2156); whereas the broadleaved forests were lowest in NPP (491.6 ± 0.6 gC∙m− 2∙a− 1; n = 4428) and WUE (0.832 ± 0.02 gC∙m− 2∙mm− 1; n = 4428), and highest in ET (594.7 ± 0.6 mm∙a− 1; n = 4428). The mean annual NPP, ET and WUE increased with stand age typically in coniferous forests, and weakly in mixed-wood forests. The natural stands had significantly (p < 0.001) greater NPP and WUE than planted stands in conifers and mixed-woods. Forest type and stand-age class are factors of key consideration in planning and managing forest landscape for achieving the compromise between regional carbon balance and water usage. Facilitating the establishment of coniferous trees and conservation of mature forest stands, and near-natural management of planted forests, can be favorable options for delivering ecosystem services of carbon sequestration and water conservation in temperate regions. Worldwide concerns on climate change and biodiversity decline have promoted global efforts in natural forest protection and expansion of planted forests, whilst the existing forests are increasingly used for non-timber ecosystem services as alternatives to conventional wood fiber production, leading to a reverse trend of changes in forest cover area and wood stocks in recent decades compared to earlier-stages of declines due to wood harvesting and clearance for agricultural production. While increases in forest cover area and improved forest productivity unquestionably benefit global forest carbon sequestration and biodiversity conservation, there are issues of consideration on their likely impacts on regional hydrological cycles (Jackson et al. 2005; Liu et al. 2016). Large-scale forest recovery and tree planting may result in increases in evapotranspiration (ET), hence reduction in stream flows (Farley et al. 2005; Sun et al. 2006; Sun et al. 2008), and in regions of water shortage, give rise to risk factors causing environment degradation (Wang and Cao 2011; Gao et al. 2014). Sustainable forest management and planning for establishment of planted forests need to take into consideration of forest productivity-ecosystem water usage relationships to compromise the balance between gain in forest productivity and conservation of water resources. Many factors can affect the forest productivity-ecosystem water usage relationships (Sun et al. 2006; Liu et al. 2015a; Feng et al. 2016). Among the dominant factors and for given climatic conditions, forest types, tree community structure, and stand development are of direct relevance to forestry and forest management. The effects of forest types and tree community structure are largely a resultant of genetic determination of water relations of forest tree species, whereas stand development may affect tree water uptake and evapotranspiration due to temporal changes in rooting depth and canopy cover. An explicit knowledge on how forest types, including the factors of tree species and community structure, and stand development would shape the tradeoff between forest productivity and ecosystem water loss is a pre-requisite for assisting regional forestry planning and forest management in the context of carbon sequestration and water conservation. The temperate forests of Northeast China were historically a major timber production base, with majority of the primary forests cleared or giving way to secondary forests due to intensive timber harvesting and conversation to larch plantations during the twentieth century (Zhu et al. 2008; Yu et al. 2011). It is now one of the target regions for forest protection and restoration in China in a national effort of conserving and improving forest resources. Proactive tree plantings are widely implemented for reforestation of the region for the benefits of non-timber forest ecosystem services. However, lack of clear understanding on the implications of tree species selection and planting regimes to long-term forest community stability and consideration of the tradeoff between productivity and water usage may undermine the delivery of desirable ecosystem services from the practices deployed in establishment and management of planted forests. In particular, analysis of recent climate change suggests increasing drought in Northeast China (Liu et al. 2011; Peng et al. 2012). This, coupled with the increasing regional demand for agricultural water usage, would raise an issue of consideration on the water economy of the planted forests. Water use efficiency (WUE) is conceptually a measure of water economy of plants. It defines the effectiveness of water conservation strategy of plants at leaf or individual level, and quantifies the productivity-water loss tradeoffs at the ecosystem level. Previous studies have demonstrated that WUE varies greatly in space and time due to changes in climate, vegetation types, ontogeny of plants, and plant community development (e.g. Yu et al. 2008; Medrano et al. 2009; Poni et al. 2009; Tian et al. 2010; Tong et al. 2014; Liu et al. 2015a; Zhang et al. 2016). A recent study reveals an observed phenomenon that natural forests are better at carbon sequestration and water conservation than planted forests in China (Yu et al. 2019). It is yet unclear on the mechanisms for the poor performance of planted forests in productivity and water conservation. It also remains a question of research interest that how WUE would vary with forest types and stand development under a given climate. In this study, over a landscape of cool temperate forests in Northeast China, we examined the spatial variations in net primary productivity (NPP) and evapotranspiration (ET) based on remote sensing datasets MOD16 and MOD17, and determined their relationships with environmental and forest stand factors by incorporating the regional meteorological data and forest inventory data. Our primary objectives were to determine how the productivity and water usage would vary with forest type and stand development, and to identify the key site and climatic factors in affecting WUE. We hypothesize that with forest stand development, there is a stage when the dual ecosystem services of carbon sequestration and water conservation could be favorably compromised, i.e. achieving a synergy between carbon economy and water economy, and that the productivity-water usage relationship vary with forest types. The study area is located in Lushuihe, Fusong county of Jilin Province (latitude 42°24′–42°49′ N, longitude 127°29′–128°02′ E), China, covering a total land area of approximately 1200 km2 and elevation range from 400 to 1300 m a.s.l. The forest landscape is representative of the cool temperate forests in the Changbai Mountain of Northeast China, with natural forests accounting for more than 80% of the forested area. The general region belongs to northern temperate zone under the influence of continental monsoon climate (Qi et al. 2016). 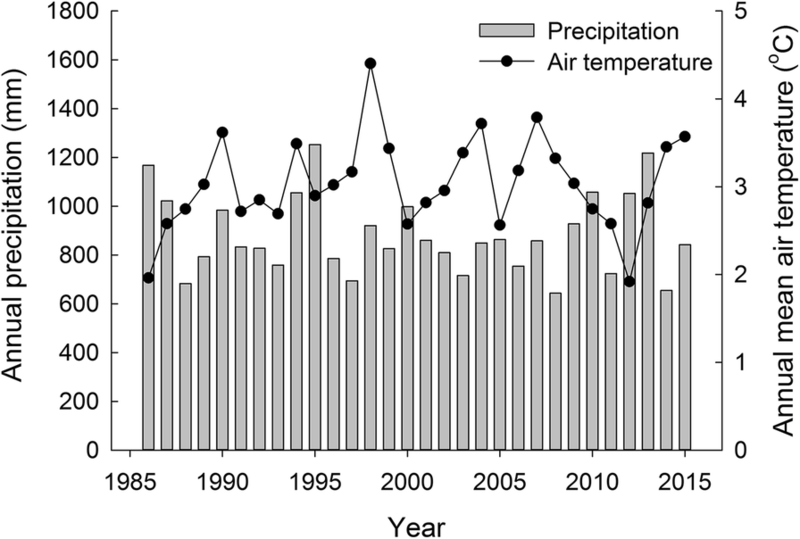 Figure 1 shows inter-annual changes in annual mean air temperature and annual precipitation in the study area for the period 1986–2015, based on data from a local meteorological station (latitude 42°29′35“ N, longitude 127°46’01” E, altitude 753.6 m a.s.l.). The regional forests subjected to partial progressive logging starting in late 1960s, mostly by ways of clear-cutting, and some of the clear-cut areas were converted to larch or spruce plantations. For concern of fast depleting local forest resources and protection of forest cover, selective logging was implemented beginning in 1985 (Fang et al. 2016), then followed by enhanced conservation efforts under the “Natural Forest Protection Program” orchestrated by the State Administration of Forestry of P.R. China at the turn of twenty-first century. The main forest types include coniferous, broadleaved, and mixed-wood forests. The dominant trees species consists of Korean pine (Pinus koraiensis), mongolian oak (Quercus mongolica), mono maple (Acer mono), amur linden (Tilia amurensis), elm (Ulmus propinqua), manchurian ash (Fraxinus mandshurica), aspen (Populus davidiana), birch (Betula platyphylla) and manchurian fir (Abies holophylla). The NPP datasets at spatial resolution of 1-km were obtained from the annual MOD17A3 products (version 55) of the NASA Earth Observation System (EOS) program, which are produced by the Numerical Terradynamic Simulation Group (NTSG) of University of Montana (UMT) (available from http://www.ntsg.umt.edu/project/modis/mod17.php) (Xia et al. 2015). The MOD17A3 products were generated using the MOD17 algorithm from the original NASA/USGS LPDAAC (Land Processes Distributed Active Archive Center) 8-day and annual v5 products, with data gaps in the 8-day temporal MODIS FPAR/LAI caused by cloudiness filled with information from accompanying quality assessment flags (Running et al. 2004; Zhao et al. 2005; Zhao and Running 2010). The ET datasets were the annually MOD16A3 product with a 1-km resolution (available from http://www.ntsg.umt.edu/project/modis/mod16.php), which were calculated by using the improved ET algorithm based on the Penman-Monteith (Mu et al. 2011). The improved algorithm employed involves simplifying the calculation of vegetation cover fraction, calculating ET as the sum daytime and nighttime components, adding soil heat flux calculation, improving estimates of stomatal conductance, aerodynamic resistance and boundary layer resistance, separating dry canopy surface from the wet, and dividing soil surface into saturated wet and moist surfaces (Mu et al. 2011; Tang et al. 2016). The ecosystem WUE was calculated from MODIS NPP and ET. Both NPP and ET data were not validated in this study due to inadequate ground-based measurements for our study area. However, many regional and global studies of NPP and ET have shown the reliability of the MODIS NPP and ET products (Turner et al. 2006; Zhao and Running 2010; Lathuillière et al. 2012; Mu et al. 2013). The two products have been widely validated around the world against measurements from eddy covariance flux tower data including AmeriFlux, Fluxnet-Canada, EuroFlux and ChinaFlux across multiple biomes (Zhao et al. 2005; Heinsch et al. 2006; Mu et al. 2011; Liu et al. 2015b; Huang et al. 2018), or from the forest inventory data (Neumann et al. 2015; Gulbeyaz et al. 2018). The use of MODIS products has also been reported to be a reliable approach in studies of regional NPP in Chinese ecosystems (Jia et al. 2012; Liu et al. 2015a; Zhang et al. 2015). The meteorological data involving precipitation, mean, minimum and maximum temperature for the period 2000–2014 employed in this study are derived from the gridded daily dataset (CN05.1) with a spatial resolution of 0.25° × 0.25° (Wu and Gao 2013), which is constructed following the “anomaly approach” during the interpolation but with over 2400 observing stations in China (Wu et al. 2017). In the “anomaly approach”, a gridded climatology is first calculated, and then a gridded daily anomaly is added to the climatology to obtain the final dataset. Gridded daily meteorological values were converted to annual precipitation, and annual mean, annual mean maximum and annual mean minimum air temperatures, using spatial overlay analysis with map algebra method, respectively. Then a bilinear interpolation method was adopted to resample the gridded meteorological data on spatial resolution of 1-km. Information on the attributes of forest stands were derived from the Category II database of Forest Inventory of Jilin Province for the period ending 2013, covering a total of 7763 compartments of varying sizes. Each compartment represented a forest stand of single type and relatively uniform structure, and contained information on spatial attributes, tree species identity, stand age class, stand density and establishment mode (i.e. established through natural regeneration or tree planting). The compartmentalized forest stands were firstly grouped into three broad types as coniferous (CF), broadleaved (BL), and mixed-wood (MW), and were then further classified by the mode of establishment (i.e. natural vs. planted) and stand age classes (young, mid-age, near-mature, mature, and over-mature) (Table 1). The stand age classes were made with reference to rotation in accordance with the standard survey and inventory protocols of the State Forestry Administration of China (Sun et al. 2016). The spatial distributions of the six classified forest types and stand age classes are illustrated in Fig. 2. Terrain factors including elevation, slope, aspect and slope position, among which the elevation data were obtained from the Global Map data archives (https://globalmaps.github.io/), while others were derived from the Category II database of Forest Inventory of Jilin Province. Soil organic carbon data were extracted from the China soil map based on Harmonized World Soil Database (v1.1), which was made available by WESTDC (Environmental and Ecological Science Data Center for West China, National Natural Science Foundation of China, http://westdc.westgis.ac.cn). To obtain the average values of annual NPP, ET and WUE of the whole study area, we firstly extracted the annual values of NPP, ET and WUE in each pixel, then the mean values were calculated as the mean of all pixels in a given year. The spatial maps of NPP, ET and WUE values were produced using the average values for the period 2000–2014 for each individual grid cell, with Arc-GIS10.1. A simple linear regression method was used to analyze the inter-annual variability and the variable trend of each pixel during 2000–2014. The slopes of linear regression represent the temporal and spatial trends: a positive value indicates an uptrend, and a negative value indicates a downtrend. A greater absolute value of slope corresponds to a more rapid variation. Spatial trend analysis was performed using ENVI5.0. We used the multiple linear regression model to examine the influence of three categories of variables: vegetation factors (forest types, mode of establishment, age class, and stand density), site traits (elevation, slope, aspect, slope position and soil organic carbon (SOC)) and climate factors (annual precipitation, annual mean air temperature, annual mean maximum air temperature, and annual mean minimum air temperature) on the spatial variations of NPP, ET and WUE across a forest landscape. The analyses were performed using R3.4.3 software (R-Development Core Team 2018). Analysis of variance (ANOVA) was used to test the main and interactive effects of forest type, stand age class, and mode of establishment on NPP, ET and WUE, using GLM procedure of SPSS17.0 for Windows (SPSS Inc., Chicago, USA). The Duncan’s multi-range test was used to compare the differences among the main effects at a confidence level of p < 0.05. Over the period 2000–2014, the landscape-level annual NPP varied markedly inter-annually, ranging between 311.7 and 573.6 gC·m− 2·a− 1, with an average value of 453.8 gC·m− 2·a− 1 (Fig. 3). Against an uptrend from 2000 to 2005, there occurred a sharp decline in NPP from 2005 to 2007, followed by mostly a recovery trend thereafter until 2012. In contrast, the temporal changes in landscape-level ET were much less variable, keeping within a narrow range of 559.9–603.0 mm·a− 1 (Fig. 3). The pattern of inter-annual variations in landscape-level WUE followed that of NPP, varying over a wide range between 0.54 and 1.01 gC·m− 2·mm− 1 (Fig. 3). There was a significant uptrend in WUE for the period 2000–2006 (p < 0.05), and a tendency of increases in WUE for the later period starting in 2007. The temporal variations in NPP, ET and WUE by forest types were similar to those for the landscape-level. Spatially, the mean annual NPP over the whole study period varied between 205.0 and 639.4 gC·m− 2·a− 1 across the forest landscape, with 99% of the areas showing an increasing trend over the study period (Fig. 4a and b). The mean annual ET ranged between 441.5 and 784.0 mm·a− 1 with an average of 581.5 mm·a− 1 spatially, with most of the areas showing a decreasing trend over the period (Fig. 4c and d). The areas with higher mean annual NPP mostly corresponded to the lower mean annual ET, typically in old-growth coniferous or mixed-wood forest stands (Fig. 2). 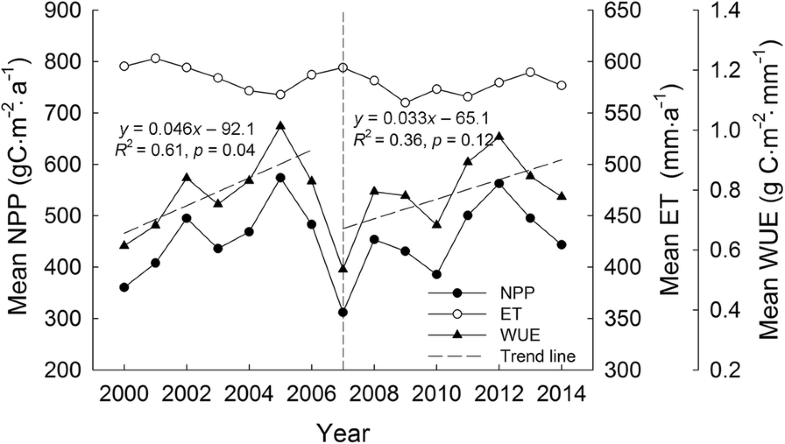 The spatial distribution of mean annual WUE was similar to that of mean annual NPP (Fig. 4e), with values in the range of 0.46–1.10 gC·m− 2·mm− 1. Multiple linear regression analysis identified forest type, stand age class, establishment mode, stand density, and three air temperature variables (annual mean, annual mean maximum, and annual mean minimum) as common factors significantly (p < 0.001) affecting the mean annual NPP, ET, and WUE (Table 2). The three air temperature variables differed in their effects on the mean annual NPP, ET, and WUE: while the annual mean air temperature had positive effects on the mean annual NPP and WUE, the effects of the annual mean maximum and minimum air temperatures were negative; the mean annual ET was negatively affected by the annual mean air temperature and positively by the annual mean maximum and minimum air temperatures. Apart from these common factors, mean annual NPP was significantly (p < 0.05) affected by slope and SOC, mean annual ET by slope position and annual precipitation, and mean annual WUE by slope position and SOC (Table 2). There were highly significant (p < 0.001) effects of forest type, stand age class, and an interaction between forest type and stand age class on the mean annual NPP, ET and WUE (Table 3). On average, the three forest types were significantly (p < 0.05) differentiated in the mean annual NPP, ET, and WUE: the coniferous forests were highest in NPP (505.3 ± 1.4 gC·m− 2·a− 1; n = 1041) and WUE (0.872 ± 0.004 gC·m− 2·mm− 1; n = 1041), and lowest in ET (584.1 ± 1.6 mm·a− 1; n = 1041), followed by the mixed-wood forests (NPP: 500.5 ± 0.8 gC·m− 2·a− 1; WUE: 0.856 ± 0.02 gC·m− 2·mm− 1; ET: 589.3 ± 0.9 mm·a− 1; n = 2156); whereas the broadleaved forests were lowest in NPP (491.6 ± 0.6 gC·m− 2·a− 1; n = 4428) and WUE (0.832 ± 0.02 gC·m− 2·mm− 1; n = 4428), and highest in ET (594.7 ± 0.6 mm·a− 1; n = 4428). In coniferous forests, there were clear trends of increasing NPP and WUE, and decreasing ET, with stand age class, whilst the mixed-wood forests displayed a weak but similar patterns of responses in NPP, WUE and ET with stand age class (Fig. 5). The broadleaved forests did not show a consistent pattern of change in NPP, ET, and WUE with stand age class (Fig. 5). There were also highly significant (p < 0.001) effects of establishment mode and an interaction between forest type and establishment mode on the mean annual NPP, ET and WUE (Table 4). Regardless of forest type and stand age class, the natural stands had highly significantly (p < 0.001) greater NPP (506.8 ± 0.6 gC·m− 2·a− 1; n = 6037) and WUE (0.877 ± 0.002 gC·m− 2·mm− 1; n = 6037), and smaller ET (582.8 ± 0.7 mm·a− 1; n = 6037), than the planted stands (NPP: 493.1 ± 0.8 gC·m− 2·a− 1; WUE: 0.835 ± 0.003 gC·m− 2·mm− 1; ET: 594.9 ± 1.0 mm·a− 1; n = 1587). However, by identifying forest types, the differences in NPP, ET and WUE between the natural and planted stands were most prominent in coniferous forests and significant (p < 0.05) in mixed-wood forests (Fig. 6). The broadleaved forests did not show any difference in NPP, ET and WUE between the natural and planted forests (Fig. 6). In this study, we used the existing MOD17A3-NPP data, the MOD16A3-ET data, and the Category II Forest Inventory data to investigate the spatiotemporal variations and controls of productivity and water use efficiency over a temperate forest landscape in the Changbai Mountain of Northeast China. Our estimates of the means and spatial and temporal variations in NPP and ET based on MODIS products for the period 2000–2014 were in line with the ground-based measurements and model simulations for the general region (Luo 1996; Ni et al. 2001; Liu et al. 2013). Although some cautions may be needed in using the MODIS data which are not locally validated, many regional and global studies of NPP and ET have demonstrated the reliability of the MODIS NPP and ET products (Turner et al. 2006; Zhao and Running 2010; Lathuillière et al. 2012; Mu et al. 2013), including the studies of regional NPP in Chinese ecosystems (Jia et al. 2012; Liu et al. 2015a; Zhang et al. 2015). Nonetheless, there may occur some degree of uncertainty in our estimates of NPP, ET and WUE across the forest landscape. Temporally, we found that the landscape-level NPP in our study area showed a sharp decline during 2005–2007, coinciding with an extreme drought event during 2005–2006, when an increase in temperature of up to 25.2% and a decline in precipitation of 12.6% were recorded (Zhang et al. 2016). Previous studies have demonstrated that ecosystem WUE can be influenced by both biotic and abiotic factors (Hu et al. 2008; Liu et al. 2015a; Zhu et al. 2015). Here we found that, across the forest landscape in our study area, all the vegetation factors investigated, including forest type, stand age class and density, and establishment mode, and the three temperature variables, including mean annual mean, annual minimum were common factors significantly (p < 0.05) affecting the mean annual NPP, ET, and WUE, with other factors of site conditions and climate playing differential role in affecting NPP, ET and WUE. Clearly, forest type, stand density and developmental stage are key determinants of ecosystem NPP, ET and WUE in our study area, similar to the findings in other studies (Law et al. 2003; Irvine et al. 2004; Wang et al. 2011; Xiao et al. 2013; Neumann et al. 2015). Also, climatic factors are important determinants of vegetation and play a crucial role in shaping spatial patterns and temporal dynamics of forest NPP, which have been investigated in many studies. Ni et al. (2001) reported that temperature and moisture are the dominant factors controlling the spatial distribution of NPP in China and the NPP of Chinese forests is positively correlated with annual mean temperature and precipitation. Mao et al. (2014) found that NPP was positively correlated with mean temperature, negatively with precipitation. Our result was consistent with the findings of Ni et al. (2001), although the effect of precipitation was not significant. This might be due to the relative narrow range of mean annual precipitation (905.8–995.0 mm·a− 1) across the forest landscape in our study area, means that precipitation was not the limited factor for NPP and partially lack of fine-grained data points for matching climatic variables and ecosystem NPP values. Interestingly, we found negative impacts of increasing mean annual minimum and maximum temperatures on NPP, possibly explainable by the effects of drought stress induced both by rising maximum temperature and insufficient winter-snows inferred by the rising minimum temperature. The responses of WUE to climate factors are more complex as it depends upon the variations of NPP, ET and the extent to which the system is water limited (Huang et al. 2015). In this study, WUE was negatively affected by precipitation. Although both NPP and ET were positively affected by annual precipitation, an increase in precipitation would likely induce a greater increase in ET than NPP, consequently leading to decreased WUE (Huang et al. 2015). Moreover, increases in precipitation during the non-growing season could also aggravate nitrogen limitation due to enhanced nitrogen leaching and denitrification (Hovenden et al. 2014), resulting in a reduction in NPP and declining WUE. Contrary to the effect of precipitation, annual mean air temperature had a significant positive effect on WUE. This might be explained by that, as the length of growing season increases due to an increase in air temperature (Körner and Basler 2010; Gunderson et al. 2012), the photosynthetic rates are accelerated (Flanagan and Syed 2011), whilst the evapotranspiration rates tend to remain unchanged or decreased due to the stomatal regulation (Serrat-Capdevila et al. 2011). Consequently, the greater increase in NPP compared to ET leads to a positive trend of WUE. In addition, the site conditions reflect the water and fertility of the forest stand, which indirectly affects the spatial pattern of NPP, ET and WUE. Our results showed that NPP was greatly influenced by site factors, including slope and SOC, such that NPP tends to be greater in the areas with steep slopes, where mostly primary forests remain intact due to access and harvesting difficulties in history. Across the forest landscape of Lushuihe and over the study period 2000–2014, the mean annual NPP, ET and WUE were affected by forest types, stand age class, and how the forest stands were originated (i.e. establishment mode); the effects of stand age class and establishment mode appeared to be forest-type specific. Among the three forest types in this study, coniferous forests were generally highest in NPP and lowest in ET, hence highest in WUE, followed by mixed-wood forests. This contradict with some of the previous studies showing highest NPP values in mixed-wood forests compared with the coniferous and broadleaved forests in Northeast China (Zhao et al. 2011; Mao et al. 2014). In our study area, the coniferous forests were dominated by the Korean pine stands, which are climax forest type of the region and have been well protected and experienced less human disturbance. Typically in coniferous forests, with some tendency in mixed-wood forests, the mean annual NPP and WUE increased with stand age class and were significantly higher in naturally established stands than in planted stands. In well agreement with a recent study at the national scale by Yu et al. (2019), we found that naturally forests were indeed better at both productivity and water conservation than planted forests, but the effects appeared to be reserved for forest-type specific and demonstrated in stands with presence of coniferous trees at the landscape level. 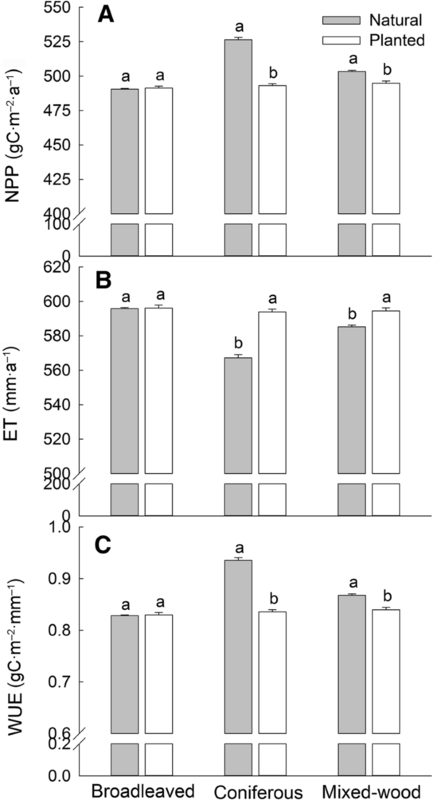 In broadleaved forests, there were no changes in NPP and WUE with stand age class and establishment mode, similar to the finding of Xiao et al. (2013) for a range of Chinese ecosystems. Our findings of increasing NPP with stand age class up to old-growth forests were somewhat in contrary to commonly accepted view that NPP declines with age or peaks at middle-age then declines in the old age (Law et al. 2003; Pregitzer and Euskirchen 2004; Wang et al. 2011; Tang et al. 2014). This pattern of declining NPP in old-growth forests was based on the assumption that changes in productivity with age in complex, multi-aged, multispecies natural forests can be modelled simply as scaled-up versions of individual trees or even-aged stands (Carey et al. 2001), neglecting other factors such as climate, management history, successional stage, stand disturbance, stand density as well as soil fertility (Pregitzer and Euskirchen 2004; Vicca et al. 2012). There were studies showing that decrease in NPP with age was not general across ecoregions and with no decline in old stands (> 200 years old) in some ecoregions (Van Tuyl et al. 2005; Hudiburg et al. 2009). This signifies the importance of considering forest management history and historical disturbances in shaping the productivity-stand age relationship. Unlike in many other parts of the world, wood harvesting in Chinese forests had historically progressed with consideration of easy access and terrain conditions, translating to incomparable disturbances and stand age classes across the landscapes in forest regions. Our study showed a significant decrease in ET with age class in coniferous forest, which is likely a consequence of decreases in transpiration with age as evidenced in many previous studies (Köstner 2001; Vertessy et al. 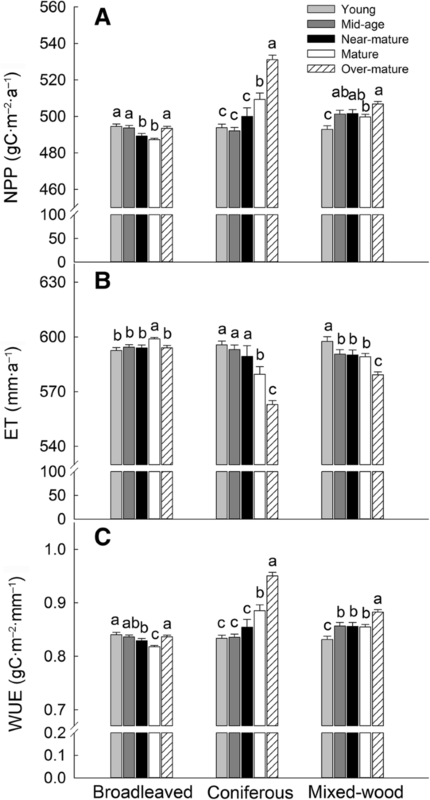 2001; Delzon and Loustau 2005), explainable by a decrease in stomatal conductance in old and taller trees (Irvine et al. 2004; Delzon and Loustau 2005). In this study, across a temperate forest landscape in Northeast China, we depicted the patterns of spatial and temporal variations in ecosystem productivity and water usage and controlling factors. Forest type, stand development, and the regeneration scheme all played important roles in determining the ecosystem productivity and relationship with water usage. Overall, the ecosystem productivity and water usage relationship does not necessarily always occur as a simple tradeoff. Forest type and stand-age class are factors of key consideration in planning and managing forest landscape for achieving the compromise between regional carbon balance and water usage. Facilitating the establishment of coniferous trees and conservation of mature forest stands, and near-natural management of planted forests, can be favorable options for delivering ecosystem services of carbon sequestration and water conservation in temperate regions. Facilitating the establishment of coniferous trees and conservation of mature forest stands, and adoption of near-natural management of planted forests, can be viewed as favorable options for delivering ecosystem services of carbon sequestration and water conservation in temperate regions. We gratefully acknowledge the Lushuihe Forestry Bureau for providing the forest resource inventory data. We would like to thank Xiyue Zhang for her assistance in pre-processing the gridded meteorological data. This research was funded by the Program of Forestry Research for the Public Benefits of Ministry of Finance of China (Grant No. 201404201). The original data are not owned by the authors and cannot be shared. The recomputed and processed data are available upon request. The conceptual framework for the study was developed by OJS and SL. XL collected and analyzed the data, and wrote the draft manuscript. TJAF and CJ contributed to data analysis and results interpretations. All authors contributed to discussions and writing of the manuscript. All authors read and approved the final manuscript.